I started a Halloween Read Along with a couple of friends, well Actually it ended up being me and one of my closest friends reading it because others dropped out. Which is totally fine. We picked Daughters Unto Devils because people on Goodreads were calling it terrifying and good. I was all about terrifying for a Halloween Read along. 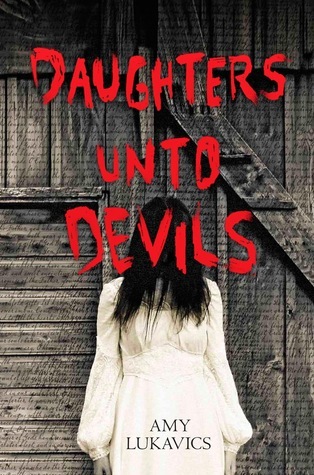 Daughters Unto Devils is about a sixteen-year-old girl Amanda Verner and her family. There’s some mystery about the last winter the family went through. There’s something happening with her youngest sister who is a baby who cries non-stop. And Amanda is secretly pregnant. Then the family moves to the prairie, and chooses to settle in a huge cabin, but when they open the door to this abandoned cabin there’s dried blood everywhere. The prairie is known to drive men crazy, crazy to the point of killing, but what happened in this cabin? What will happen to this family? Ya know, going in I thought I would be instantly scared. It was more that I was instantly disappointed. The writing was good, but the story fell flat. The characters all seemed like the same person with little to no differences in personality. Also why the HELL would you go and settle into a bloody cabin and think your life would be normal? I mean sure they cleaned it up but really? I bought this one on my kindle, and it honestly didn’t get “creepy” until I was about 80% done with the book. I say creepy, because whoever is calling this terrifying must have a super low threshold for fear. This was not terrifying. I had this discussion with my friend who also read the book, and we both agreed that it is actually quite difficult to find a truly scary book. I know you’re probably thinking “Uh, hello Stephen King?” but I like his books, not all of them, but some. I read The Shining last year and it was certainly scarier than this nonsense of a book, but a lot of horror in novels, isn’t actually that horrific. My problem with Daughters Unto Devils is that I feel it was a missed opportunity. I realize this was a YA novel but still there should have been more scary parts mixed in, there should have been more creepy scenes mixed within the pages. Sure the ending was weird and creepy, but that’s it. It was one of the most disappointing reads this year. I originally gave it three stars on Good Reads but I changed my mind the more I thought about it for this review. If you get scared easily, sure check this out. If you’re like me and need something seriously scary to get to you, then check something else out. This is NOT terrifying as so many people claimed it to be. This is why I always read things even if they have weird reviews; to form my own opinions on them. This gets two out of five metal horns from me. I totally know what you mean. There are very few books that I actually find scary (even though I’m scared of like everything). I think maybe it’s because in film we’re not only getting a visual but what really heightens how scared we are is the suspenseful music which you just can’t get with a book. We’re also able to read at whatever speed we want instead of having to wait for a few seconds after a character hears a noise or something. That’s probably it. There is one that started to be pretty scary, but its a monster of a book and I have not finished it. House of Leaves is the title. I think next year I will read it from beginning to end. I will need a block of time to finish it though.